in the Resident Evil series… though, for avid readers of Cinemagogue, you know that’s not necessarily harsh criticism. Still, while the film is enjoyable for fans of the genre, even I was surprised how unabashedly it borrowed from the themes and style of other films, from Romero to Hitchcock. Knowing this wasn’t going to be winning any Oscars, I enjoyed the flick for what it was and even found it fun to nail the many influences on the film, with the same precision Milla’s character nails a zombie’s head to a trailer with an arrow. In the first Resident Evil film, Alice (Jovovich) awoke without memory and struggled through an underground laboratory facing zombies, supercomputers, and the other problems caused by the diabolical Umbrella Corporation. In Resident Evil: Apocalypse, the virus had spread above ground through Raccoon City, and mutating Alice fought against time, more monsters, and Umbrella to help a small band of bystanders and police escape the doomed metropolis before a bomb dropped to “solve” the problem. Her body had been altered by the Corporation and she continued to manifest enhanced physical prowess and even mental powers. As “Extinction” begins, we see the problem in Raccoon City was not solved… and the earth has been overrun with zombified humanity. Only pockets of UN-undead remain. All of the favorite paces from the former movies surface in this film, directed by Russell Mulcahy (who gave us the original Highlander – there can be only one). Alice fights zombie dogs, performs amazing aerial kicks… even the beginning and ending of this film finds her in a room exactly like the home she woke up in at the beginning of the first movie. The apocalyptic scenes then move beyond the franchise and evoke other imagery. The clothing and convoy of the remaining humans in the Nevada Desert evoke Mad Max 2: The Road Warrior, and as they pull into a sandswept Vegas the tipped Statue of Liberty replica reminds us of Planet of the Apes. When a murder of virus-infected crows attack the defenseless men, women and children, it’s a bloody update of The Birds. The most obvious influence, however, is George Romero’s third Zombie movie, Day of the Dead. Hordes of zombies crowding the fences surrounding a mostly subterranean Umbrella facility, are an unmistakable homage to that film; the Umbrella scientist’s plan to “domesticate” the zombies is borrowed nearly point for plot-point (though the results vary), and a plan to use a helicopter for escape is a classic Romero image. It also turns out that, unbeknownst to Alice, she holds the key for a cure, which is why Umbrella is after her yet again. Mulcahy knows how to make a functional action picture. 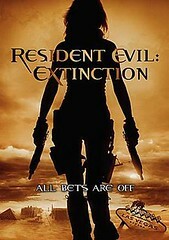 “Heroes” actress Ali Larter adds to the Resident Evil mythos as Claire Redfield, leading the band of disposable human extras through the wilderness in search of the promised land. When Alice runs across the convoy’s path, she is reunited with a former comrade-in-arms from Apocalypse, providing the dwindling humans with a glimmer of hope. Sadly, the protection Alice brings with her special powers is accompanied by escalated dangers. guaranteeing gunplay, fisticuffs, and a confrontation with the man who mutated her DNA. Like the other films, there is a resolution, but an open-ended opportunity for another sequel outbreak. My main complaint with the film is that Milla Jovovich’s face is digitally softened and smoothed in several scenes to the point of notable absurdity. She’s living in a desert apocalypse, guys. a couple age lines should be acceptable. Making your actress look digitally doughy doesn’t make her any prettier. I’ve dealt with our modern-zombie fascination in text and audio reviews in the past, and will post more about it in coming weeks. I wonder what readers think about our morbid fascination with the shambling, mindless, walking dead, and why we seem to keep begging for more, like zombies moaning for brains. Comments welcome. Our World, A FALLEN KINGDOM? No kidding! There were times in the film where I kept asking myself if they had done that on purpose to try to give the impression that she was sorta superhuman and not subject to the ravages of time and environment, but when, in other shots, she looked normal, I realized it was just bad filmaking. Really, really weird decision, particularly since she’s so beautiful without the digital enhancement. Otherwise, I really liked it. Most entertaining one of the bunch, IMO.